Paper-based bookkeeping is still visible for some small business, especially if you’re not GST registered and you don’t extend credit to customers. Otherwise, accounting software can save you time and help project a more professional image through printed invoices and other documents. The choices available to Mac users are wider than you might think. Not everyone needs the same set of features from an accounting package. You may buy and sell physical products, convert raw materials and components into finished goods, provide services, or some combination of these. Consequently, you may or may not need inventory management, bills of materials or time recording. If all your customers pay cash on the spot, you don’t need to generate statements or aged debtor’s reports. You only need payroll facilities if you have employees. Some business need to provide formal quotations to potential customers, other don’t. If you do, it should be possible to turn a quotation into an order without re-entering all the data. If you are a not so small business, you might need multi-user capabilities so that one person can operate the program from the sales counter while another processes the payroll or accounts payable in the back office. If the business has installed a mix of Macs and Pcs, cross-platform support could be a benefit, but we double it would be a deciding factor. Be prepared to pay for technical support for your accounting software, but note that vendor may draw a distinction between calls around the initial installation and configuration of the package, and help with ongoing use (such as questions like “how do I generate a BAS”). Some people like the certainty of a pre-paid support plan that includes any updates, while others prefer to pay as they go. Small business people often do their bookkeeping at night or on weekends, so check if support is available when you may need it. MoneyWorks Gold – MoneyWorks has a clean, generally Aqua-like design but when entering data pressing the Tab key reveals a list of values for that item in a separate window. Tab normally moves to the next field, and we would strongly prefer a popup menu. These list can be set up in advance an added to on the fly. Cash receipt and invoices are handled separately, which can reduce the effort required, and invoices and other documents can be e-mailed as an alternative to printing. While time can be treated like a product (for example, three hours at $100 per hour), and job costing is included, there doesn’t seem to be an automated way to collect the time that people spend on specific jobs. By default, some transactions (such as orders) entered don’t take effect until explicitly posted, but others (such as receipts) do – and once posted they cannot be changed. This may mirror the practices used in larger-scale accounting, but we think it ads unnecessary complexity for small business. Bank accounts can be reconciled with the corresponding MoneyWorks accounts. Downloaded bank statements can be imported, but as the manual points out, almost all of the transactions should already be recorded in MoneyWorks. The program can also make electronic payments through some banks. A good selection of reports are provided, but they are scattered around the Navigator interface. There seems to be a disconnect between the menus used in a traditional Mac application and the web-style interface provided by Navigator. Most accounting programs and other applications built around a database write data straight to disk and there no concept of saving a document. Moneyworks prompts you to save every 30 minutes. MoneyWorks Gold has multi-user features that can be used on a single computer to restrict certain users access to particular feature, or to allow simultaneous access to one set of accounts from multiple computers. Integration with FileMaker is possible via a plug-in available from Cognito’s web site, and with other applications via AppleEvents, though very little information is provided.The package includes extensive documentation in two landscape format spiral-bound books. Our only quibble is that the index (which cover both volumes) should be repeated in the advanced features guide. If your needs are simpler, you may be better served by eiter the Cashbook ($225) or Express ($450) version of MoneyWorks. As its name suggest, Cashbook’s limitations include the absence of accounts payable and receivable, and GST is only handled on a cash basis. All version includes contact management. MoneyWorks datacenter allows multiple accounts databases to be hosted on a single server. This could be useful in a situation where one group of staff are responsible for the accounts of several related companies, or for accounting/bookkeeping practices that do the everyday work for a range of clients. 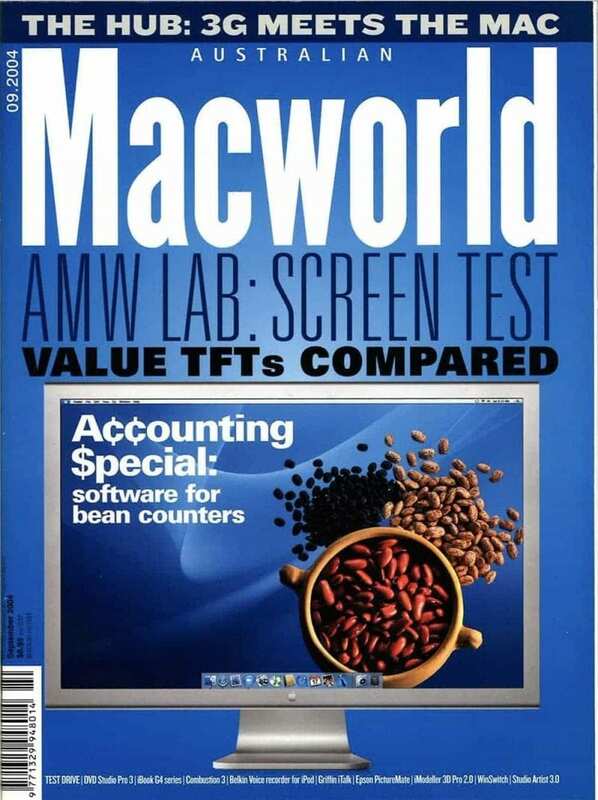 There is shareware accounting program, and they’re not all foreign. You don’t need to run accounting software on your own computer. Web-based services such as NETaccounts and Netsuite provide accounting applications that you can use from a web browser, and both these companies explicitly support Mac OS X. NETaccounts provides straightforward accounting at an affordable price for service business with up to 20 employees and turnover below $1 million. Inventory support should be added before the end of the year, broadening its appeal. The Netsuite products are target at companies from five to 500 employees. MYOB First Edge – Our original FirstEdge disc was faulty, and putting it into the Mac resulted in a kernel panic. Its replacement was visibly from a different batch, and worked properly. An installer takes care of putting the pieces in the right place, and the setup assistants work well and provide a good selection of business types that determine the list of accounts. FirstEdge is marketed as a basic, application and all the basics are there: invoices, expenditure, Jobs ( to track income and expenses related to specific projects ), bank reconciliation and a good selection of reports including BAS preparation. It covers the basics well, and is suitable if you don’t need inventory payroll or time billing. Invoices and other documents can be printed or faxed. PDF versions may be saved to disk or sent via your default e-mail program. Approved users can take advantage of the MYOB computer payment service – aka M-powered invoices – so their customers can pay via BPay, credit card by phone or Postbillpay. The other M-powered services are not yet offered to users of MYOB’s Mac product. Statements from internet banking can be imported and transactions automatically matched with those you’ve entered in FirstEdge. Any remaining can be manually matched if the details were sufficiently different to confuse FirstEdge or added as new transactions. Even if you don’t use this feature, bank reconciliations are easy. The budgeting feature lets you track your performance and allows for percentage or absolute changes from month to month: handy if you’ve set sales growth or cost reduction targets. BAS preparation is via a separate program, which ran in Classic during our testing. (According to MYOB it should run natively, but they couldn’t identify the cause of this problem). It is very sluggish, and the setup is confusing as it is done via the calculation sheet even if you are using accounts method. The manual is good. Its written clearly, well-arranged and provides understandable examples. As MYOB has been through so many generations of Mac software, we expected all the rough edges to have been smoother off by now, but we were disappointed. Some interface elements including the non-standard button design used in some places, stick out like sore thumbs. The command center acts as the home page but doesn’t provide direct access to all common tasks. For example, creating an invoice means clicking Sales Register then New Sale or making a menu selection. Whenever you want to pick from a list (of customers, for example), FirstEdge opens a new window, which means unnecessary mouse movement. There is an option to sort and select list items by name instead of number, but then you must enter the name in the number field, very strange. Lists aren’t always filtered by type: if you’re receiving a payment for an invoice and want to select the account that will receive, the list presented includes asset, liability, income, cost of sales and expense accounts. If you’re entering an invoice and need to create a new customer, that customer isn’t selected when you return to the invoice. Want to use the mouse to activate calendar entry in a date field? Tough, you have to use the keyboard. FirstEdge doesn’t memorise transactions, so if you – for example – often use the same car park when you visit a client, you have to fill in the transaction details each time. Recurring transactions are supported but they seem designed to suit regular transactions such as rent payment, rather than those that are repeated ad hoc. Ask a friend that uses QUickbooks on Windows to show you how this can be implemented well. Overall, the program seems designed for the person that uses it intensively and keeps their hands on the keyboard. It is harder than necessary for someone who only enter their sales and expenditure once week and prefer to mouse around. 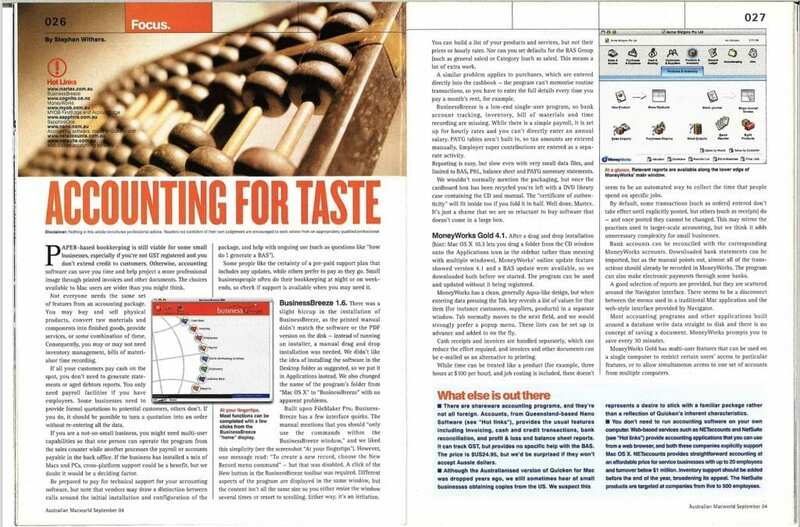 While this feature concentrates on smaller business, high end accounting software does exist for the Mac. SapphireOne is a direct competitor to Solution 6, which is now owned by MYOB. Unlike that package it is available for Mac OS as well as Windows (in fact, one look at SapphireOne’s web site – you will find it hard to believe it’s not OS X only ). It includes asset management, payroll, human resources (HR), inventory and supply chain management in addition to financials. “We are the only vendor that has an ERP system for MAC OS X “, says CEO John Adams. The company claims SapphireOne can store unlimited historical data without affecting performance. The company as some substantial customers. Once generates up to 1000 invoices per day, another has 35 concurrent users of the software, and a third has gross revenue of $1.2 billion. At the other extreme, some customers have just one or two users, but take advantage of features such as serial number tracking or project management that are missing from simpler packages. Some charities have selected SapphireOne due to their particular payroll requirements. MYOB Account Edge – Most of our comments about FirstEdge also apply to AccountEdge. We‘ll concentrate here on features specific to AccountEdge.The payroll facility is recommended for up to 20 employees and includes PAYG tax calculations and variations, superannuation, and holiday and sick leave accrual. Inventory features include auto-build from components, multiple pricing ( for whole-sale and retail customers) and quantity rates. Many small business provide services rather than products, and AccountEdge’s time billing capability includes an activity timer to record the duration of particular tasks, but it is an integral part of the program can’t readily be deployed throughout your workforce. Activity records are easily turned into invoices and also time billing provides for subcontractor’s time and non-chargeable activities. AccountEdge provides more than twice as many predefined reports as FirstEdge to support these additional functions. The BAS preparation runs natively in Mac OS X, but is still very slow. Multiple currency support is helpful if you account on accruals basis and ever make sales or purchases denominated in foreign currencies. Any real-ised gains or losses caused by exchange rate movements are handed automatically. AccountEdge can record your contacts with customers and can generate personalised letters with Microsoft Word X (but not 2004) . AccountEdge reports can be sent to Excel, but there’s no simple way of exchanging information between AccountEdge and Entourage ( to record e-mail as contacts for instance). Different users of the same computer can be granted selective access to various part of the program. Although a company file can be shared by multiple users on a network, MYOB recommends that single-user access is used whenever possible. Various tasks (such as changing an employee’s payroll information) require single0user access. While the command Centre looks more complex than FirstAccounts does, more functions are directly available. AccountEdge also does a much better job of filtering lists in that fewer irrelevant options are displayed. For example, only asset accounts are listed when choosing the destination of a payment received.